History: (Marvel Universe Millennial Visions 2001 - "Champions: United We Stand" (fb) - BTS) - When the Apollo 13 spacecraft successfully landed on the moon and returned to Earth, it brought back with it a virus that killed anyone with a "melanin deficiency" or essentially, anyone with light skin. The virus came to be called the White Plague as it killed most of Earth's heroes, including the Avengers, the Fantastic Four, and the X-Men. (Marvel Universe Millennial Visions 2001 - "Champions: United We Stand" (fb) - BTS) - Many new heroes emerged unharmed by the virus, including the Falcon, Jericho Drumm, Misty Knight, Bill Foster, Blade, and Luke Cage, the Power Man. (Marvel Universe Millennial Visions 2001 - "Champions: United We Stand") - The new heroes decided to band together, united as the Champions. Comments:Created by Georges Jeanty and Karl Story. Blade was born a half-vampire, as his mother was bitten by a vampire while pregnant with him. Thinking himself immune to vampire bites, Blade dedicated his life to stopping vampires, until he encountered Dracula himself, who transformed Blade into a full vampire. 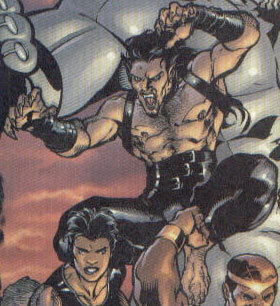 Following his transformation, Blade joined the Champions and with each day, became more and more ravenous. --Marvel Universe Millennial Visions 2001 - "Champions: United We Stand"
Jericho Drumm was very involved in Haitian Voodoo rituals until Doctor Strange was killed by the White Plague. Taking over where Strange left off, Jericho became Earth's new Sorcerer Supreme, joining the Champions and keeping to himself most of the time. Samuel Wilson was a mutant, born with bird-like wings on his back. As he grew up, he became a practicing lawyer until the White Plague affected Earth's population. Deciding to become a hero, Sam chose the codename of the Falcon and was the first to join the Champions. Following the death of Ant-Man due to the White Plague, Bill Foster took Ant-Man's shrinking formula, shrinking down to size. 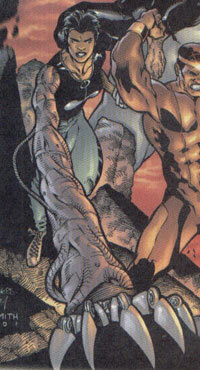 In order to reverse the process, Bill Foster used Nanite technology to grow to gigantic size, causing him to transform into a robot-like state while at large size. 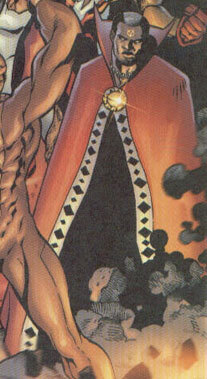 Unfortunately, Foster could not devise a way to shift back into his normal form and remained in the giant, robotic form when he joined the Champions. Grieving over the death of Danny Rand due to the White Plague, Misty Knight disappeared for a while. Returning after the Plague destroyed most of Earth's population, she now possessed a completely bionic body and could morph her arms into anything imaginable at will. She eventually decided to join up with the other heroes as the Champions. While in prison, Luke Cage "volunteered" for experiments that left his body superhumanly strong and bronze. Becoming a hero, Cage joined up with others as the Champions.